Ok, so I’m roaming around on the internet doing research for another blog post I’m working on, when I run into the Weak Tie Hypothesis. It argues that, in any social group consisting of persons A, B, C, etc, if A and B are strongly connected and A and C are strongly connected, then B and C are also linked. To extend this further, we could say that B learns of a job opening in a neighboring firm, which he tells to A, who tells to C and gets the job she never would have known about without B. Social groups are in debt to these weak links for keeping the groups up-to-date on things going on outside the group or keeping them connected to other groups. Since we can label and differentiate these weak links from strong links, can we then determine their level of influence? Assuming the answer to the above is “yes,” can we then take that micro-level (individual-level) hypothesis and apply it to macro-level (group-level) research? This stuff is fascinating. As a symbolic interactionist who is working on the connection between micro and macro level research, a system that can be used to measure not only the influence of individuals on other individuals, but one that could measure the influence of systems on those same individuals would be a great tool. 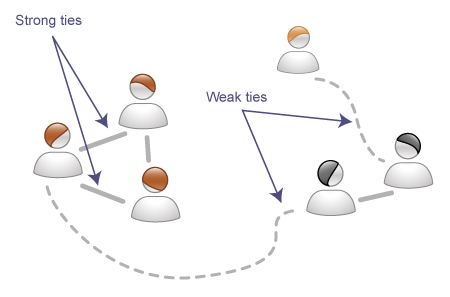 What if we could accurately measure, by means of these weak ties, a group’s influence on society? Then it wouldn’t be a matter of changing the minds of the people in the group, but changing the minds of their weak ties that would cause their downfall. Since weak ties bring new ideas, keep groups relevant, and sometimes bring in new members, removing access to these weak ties could utterly destroy groups within a very short time. Furthermore, could we measure exactly how many weak ties an idea needs in order to become a movement, or to make a video go viral, or to create social change? Goddamn. At least, that is what Annie Leonard says from the documentary video “The Story of Stuff.” You can watch it at www.storyofstuff.com. Never before have I seen the process of consumerism brought under the magnifying glass like this has. From where the raw materials come from to where they eventually go to; this movie walks the viewer step by step through it all. No matter your level of education about this issue, no matter your social or economic status, you should watch this film. We all know: from the lowest-paid worker in the overexploited nations to the meagerly-paid blue collar American, that there is something wrong, we just can’t seem to all put our fingers on it or wrap our collective heads around it. Annie Leonard helps put some of the pieces together. One of the interesting concepts she brings up is “externalized cost.” As she explains on the website: “[…] the price tags on consumer products don’t capture the true cost of producing and distributing all this stuff.” In the big box stores, or in any stores for that matter, when consumers want a product sold to them cheaper the store only has a few options to them. They can either: take a cut in profits (highly unlikely), buy it cheaper (more likely), cut their cost in the item, or not care what you think. The problem comes in when the store chooses option two or three. To cut their cost in the item, or rather, their cost of storing and staffing the store house, they have to cut pay or benefits. Failing to meet the customer’s price at that point, they will buy it cheaper. This results in the same problem as before; too many people get their wages or benefits cut just so the consumers can have something they didn’t need in the first place cheaper. By putting the excess cost of the items on the actual people that produce the goods, distributors and manufacturer can enjoy the same amount of profit and still provide consumers with the lowest price. This has to end. And only the consumers can end it. We are the ones who create the demand. We are the ones who settle for products that will not last longer than a few weeks. We are the ones who are turning a blind eye to the injustices visited upon our planet, our fellow people, and ourselves. Visit www.storyofstuff.com and get educated on what we are doing to the planet, our friends, and ourselves. It is time to ensure the continued story of our planet.